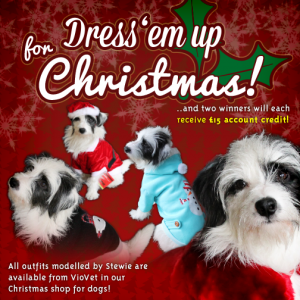 Dress 'em up for Christmas! Dress your pets up for Christmas! Calling all pet owners! Send us pictures of your pets or horses looking festive! There will be 2 winners - one decided by the amount of "likes" given by VioVet facebook followers, and the other chosen by us! Do of course take into consideration the welfare of your pet when dressing them up, and make sure they are having fun taking part! If your pet doesn't enjoy dressing up then instead add graphics to the image, or make festive the surroundings. Each winner will receive £15 worth of account credit. Simple, just picture reply the entry post on our facebook page, or tweet us @VioVet1 your picture and we will add it to the post. You can post up to 1 picture a day, only your first post each day will count. The facebook post can be found by clicking here! Closes at midnight on Monday the 9th of December. We will then put all of the entries into a blog post to show off just how Christmas-sy your pets look! Good luck, and we look forward to seeing how creative you can be! Please note, by posting your image on our facebook wall you are granting us permission to use or otherwise modify your image within any promotional material for this competition.